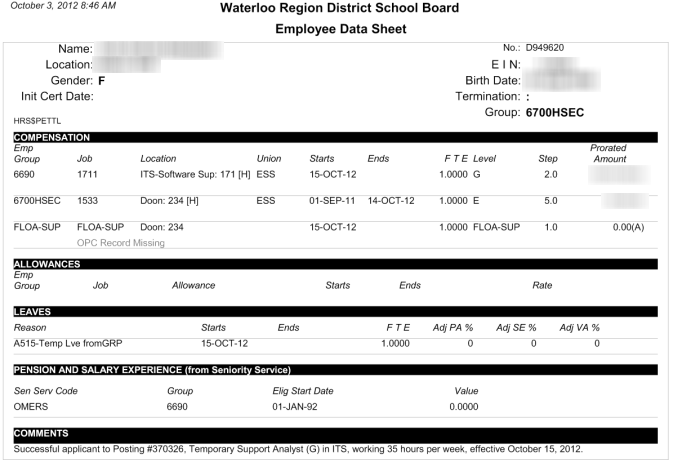 The Waterloo Region District School Board (WRDSB) located in Ontario, Canada, services approximately 63,000 students across 123 sites with a staff of roughly 9,000. Within the human resource services department, the human resources and payroll teams work very closely to process employee documents— including data forms. 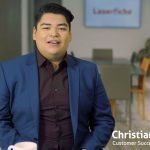 Here is how we’ve streamlined this previously paper-heavy and cumbersome process with Laserfiche. A data form is an electronic confirmation page generated any time employee information is inserted or updated in our integrated payroll-personnel system. In the past, processing data forms was a very paper-heavy, time-consuming and inefficient process. The system was missing consistent controls since HR manager approval was not always required before forms were sent to Payroll. There was also a significant production of paper (represented by the green boxes in the diagram below) that resulted in printing, filing and mailing costs. Laserfiche has allowed us to not only get rid of paper, but also to automate previously manual tasks. 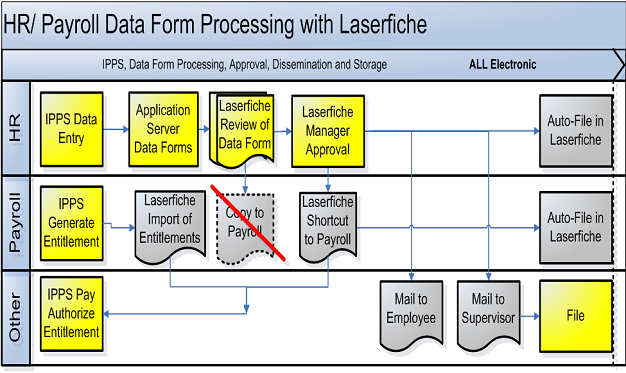 The new process is pictured below (the gray boxes signify processes automated with Laserfiche Workflow). Now when a new employee document, such as a leave of absence request or benefit application form, arrives at Human Resource Services, it is scanned directly into the employee’s folder in Laserfiche using Laserfiche Scanning. If a folder doesn’t exist (because the document is for a new employee), Laserfiche automatically creates one. During the scanning process, the human resources assistant populates the “Employee ID” field and Laserfiche Workflow inserts metadata such as the name, location and group code by performing a lookup from the payroll-personnel system. Other metadata fields are updated to either continue the workflow (such as “Data Form Status”) or record explanatory information (such as “Manager Comments”). Using dual monitors, the human resource services assistant can review the employee document and enter the information directly into the integrated payroll-personnel system. The data form is generated and printed to Laserfiche with Laserfiche Snapshot where the assistant links it with the original document using the Linking feature in the Laserfiche Client. 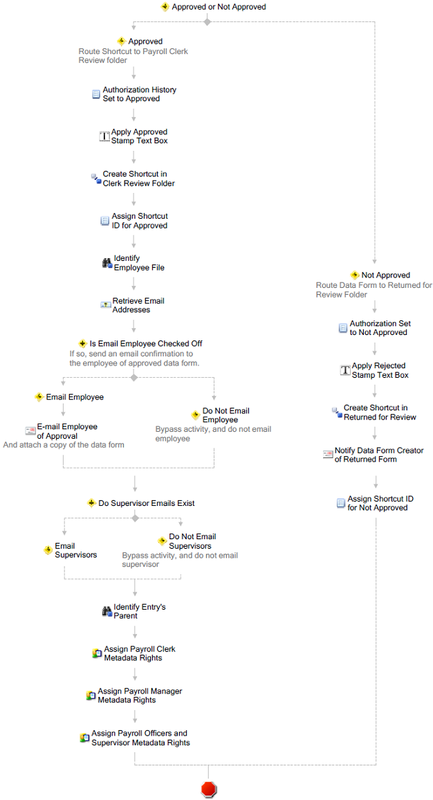 Laserfiche Workflow routes the data form and linked document to the manager for authorization. 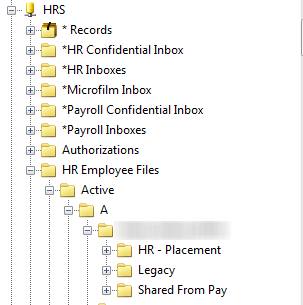 It creates an HR manager folder if one does not currently exist and places a shortcut to the data form in the folder for HR manager review. 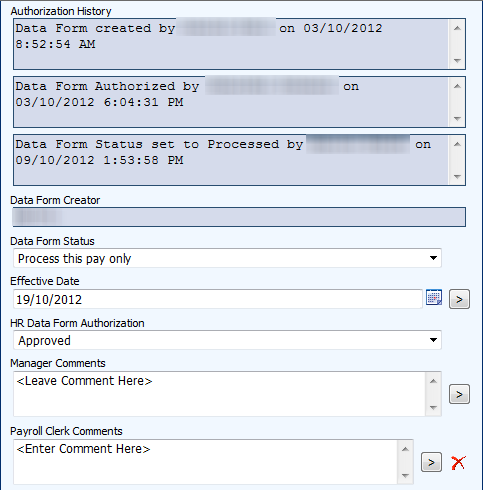 The manager reviews the data form and either approves or rejects it by changing the value of the “HR Manager Authorization” field to either “Approved” or “Not Approved”. If the form is approved, a text box with the text “Date form approved by approver’s name on date at time.” is then added using the “Add Textbox” activity and the form is routed to Payroll. Approved data forms result in a notification e-mail to the employee and, if the change will impact the worksite such as a leave of absence, to the employee’s supervisor. If the data form is not approved, a “Data form not approved by approver’s name on date at time.” Text box is added and returned to the human resource services assistant via an automatic e-mail asking her to make the requested corrections and resubmit. 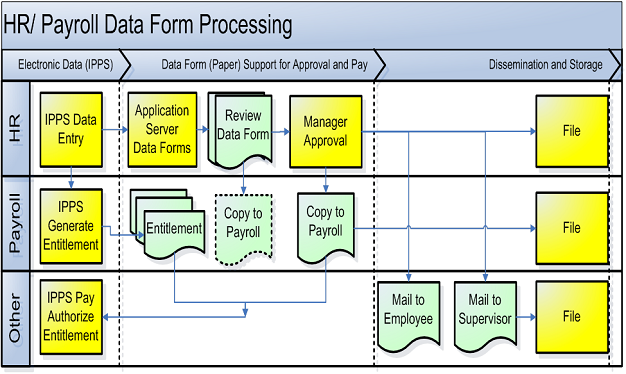 Here is the section of the workflow that deals with the payroll department’s review and approval process. 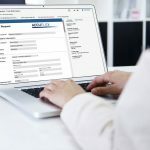 When Payroll receives the data form, a payroll clerk links it electronically to the “Notice of Entitlement”, validates the document by changing the value of the “Status” field to “Validated” and applies the appropriate pay cycle. If the document requires a future action, such as making changes to an employee’s salary as identified in the data form, a custom process automatically moves it into the appropriate pay cycle folder for the assistant to review in the future. Every action is recorded in the document’s metadata “History” field. 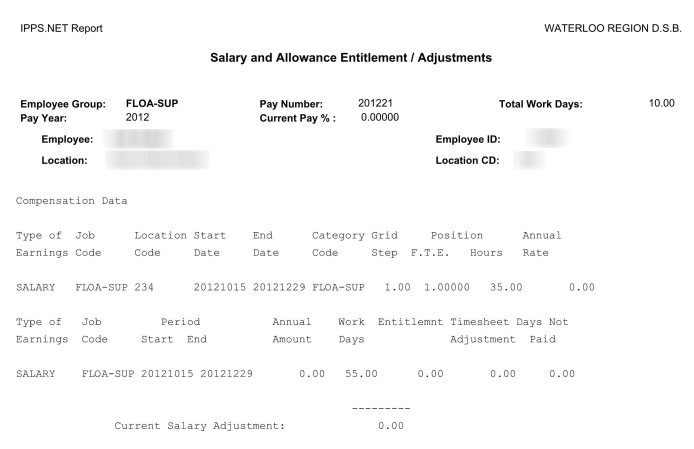 All data forms are stored in the employee’s HR file and all Notice of Entitlement forms are stored in the payroll file. The use of Laserfiche has fundamentally changed the way data forms are processed. Paper has been eliminated, but more importantly, manual processes have been automated saving time and increasing efficiency. There has been a standardization of the authorization process by HR managers that improves controls. This has resulted in a significant reduction in overall processing time. 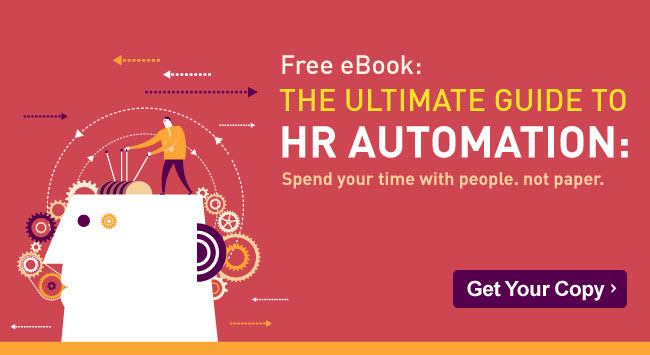 There are no longer lags in sorting and distributing data forms between HR and Payroll. Employee support has been improved by reducing processing time and allowing HR assistants to quickly respond to changes and requests for information. There has been improved service to our clients (employees). HR assistants are able to respond to questions more efficiently through online lookup rather than having to go to a paper file.